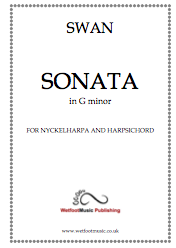 A sonata in the baroque style originally written for nyckelharpa and harpsichord, versions are available for violin, viola, ‘cello and double bass. Please note that EU member states need to add postage to their purchase as the content will be supplied on a CDrom. EU member states need to add postage to the purchase of any of the above pdfs.